Not to be confused with Collegno. A viola being played col legno. In music for bowed string instruments, col legno, or more precisely col legno battuto (pronounced [kol ˈleɲɲo batˈtuːto], Italian for "hit with the wood"), is an instruction to strike the string with the stick of the bow, rather than by drawing the hair of the bow across the strings. The earliest known use of col legno in Western music is to be found in a piece entitled "Harke, harke," from the First Part of Ayres (1605) by Tobias Hume, where he instructs the gambist to "drum this with the backe of your bow". The percussive sound of col legno battuto has a clear pitch element determined by the distance of the bow from the bridge at the point of contact. As a group of players will never strike the string in exactly the same place, the sound of a section of violins playing col legno battuto is dramatically different from the sound of a single violin doing so. The wood of the bow can also be drawn across the string — a technique called col legno tratto ("with the wood drawn"). This is much less common, and the plain marking col legno is invariably interpreted to mean battuto rather than tratto. The sound produced by col legno tratto is very quiet, with an overlay of white noise, but the pitch of the stopped note can be clearly heard. If the sound is too quiet, the bow can be slightly rolled so that a few bow hairs touch the string as well, leading to a slightly less "airy" sound. 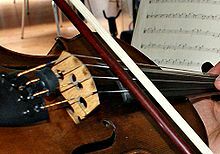 Some string players object to col legno playing as it can damage the bow; many players have a cheaper bow which they use for col legno passages, or for pieces which require extended passages of col legno. Some players tap the strings with pencils instead of bows, producing a further percussive, lighter sound. Joseph Haydn directs the strings to play col legno at the end of the slow movement of his Symphony No. 67. Wolfgang Amadeus Mozart uses this technique in the final movement of his Violin Concerto No. 5, where the low strings play col legno accompaining the soloist, which gave this concerto the nickname "The Turkish". The final movement of the Piano Concerto No. 2 by Frédéric Chopin. The "Dream of Witches' Sabbath" in the final movement of Berlioz's Symphonie Fantastique, as used in the score of the film Alien by Jerry Goldsmith. Shostakovich's Symphony No. 7 where the violins have a counter melody with the winds, or in the fourth movement of his Piano Concerto No. 1, where strings maintain the background pulse while the trumpet carries out its solo. The Mexican dance in Aaron Copland's Billy the Kid, where the col legno provides a joyful dance feeling to the music. Col legno tratto is used in the first and the third movements of Webern's Four Pieces for violin and piano, Op. 7, as well as in the opening of the second scene of Berg's opera Wozzeck. "Burn the Witch" from Radiohead's A Moon Shaped Pool. ^ Peter Walls, "Bow" II. Bowing, The New Grove Dictionary of Music and Musicians, second edition, edited by Stanley Sadie and John Tyrrell (London: Macmillan Publishers, 2001): §2, xi. ^ Strange, Patricia; Allen Strange (2001). The Contemporary Violin: Extended Performance Techniques. Berkeley: University of California Press. p. 108. ISBN 978-1-4616-6410-9. Wikimedia Commons has media related to Col legno. This page was last edited on 1 March 2019, at 00:31 (UTC).